Majuli is a stunning and picturesque island in Assam's mighty Brahmaputra river and is also the world's biggest river island. 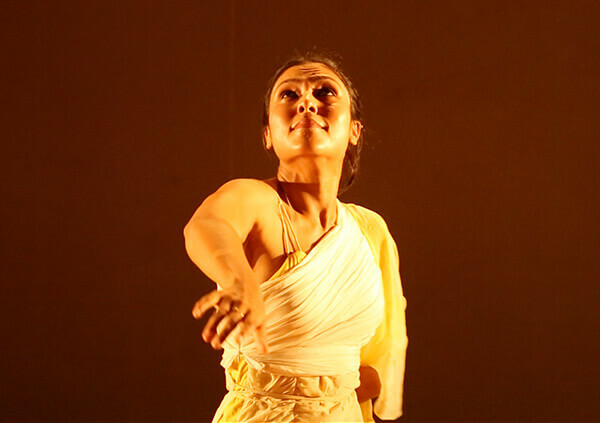 This performance tells the tale of Majuli through an intense and evocative narrative of movement, dance and theatre. Inspired by the mystique of the Brahmaputra, the landscape of Majuli and the social, cultural and spiritual life of its people, it weaves together a story of the intricate bond between people and their land, and close relationship with 'their' river, both life-giver and destructor. Set to music created by instruments used by the Assamese, the Deori and Mising communities of Majuli, the performance has dancer Shilpika Bordoloi meander in the rhythm of a river. Pleasure, pain, flirtation, love, catharsis, and spiritualism characterise her performance, which is overlaid by the motif of the 'boat' against a backdrop of rain. Shilpika Bordoloi is a well-known classical dancer and has trained in Manipuri and Bharatanatyam dance forms as well as in martial arts.